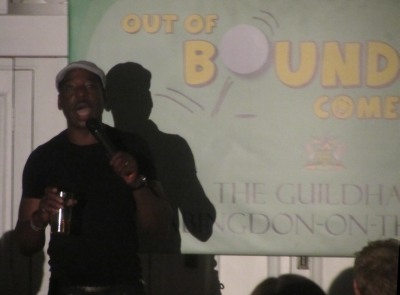 Last Thursday of every month there is “Out of Bounds” Comedy at the Guildhall. Johanna, who puts on these events, created such a warm ambiance in the Roysse Room with the decor. It was a long way from being the school room that it once was. Rudi Lickwood, the headline act, was real class. He took us out of bounds with some of his jokes. 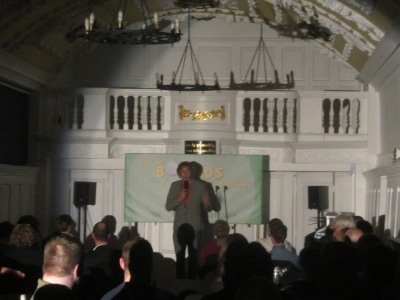 Comedy at the Guildhall suggested to him a grand venue. There was a good audience, and it worked well, even if the microphone did fail at one point. I look forward to the July event when two prominent acts come to Abingdon before starring at the Edinburgh Fringe. 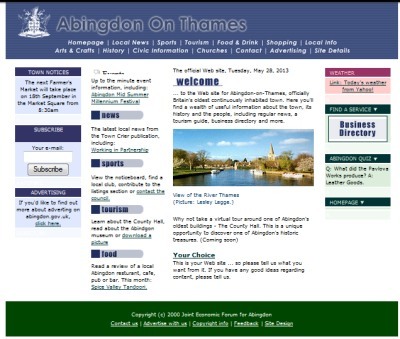 P.S Abingdon Blog will be unavailable from 7pm this evening (31/05/2013). This will last about 6 hours. Host Servers are moving. 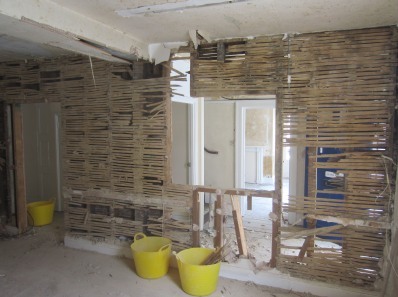 1-3 Ock Street has its own blog – written by Chris Wilshurst of Kemp & Kemp. 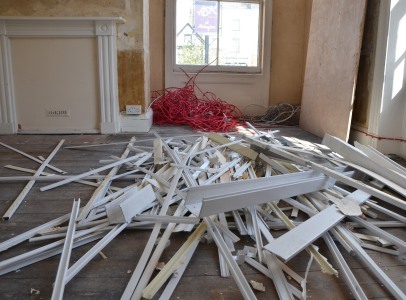 This week Chris shows the stripping away of plastic trunking and some recent discoveries. 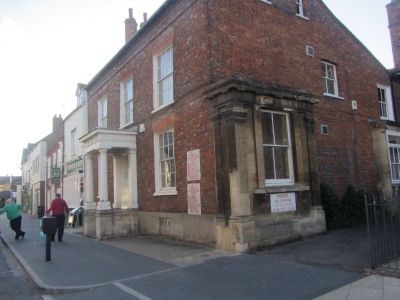 This is not just a blog about restoring a fine old building, it is also an exploration of the people who once lived there. We learn about R D’Almaine whose name is on the war memorial in the Square down below. 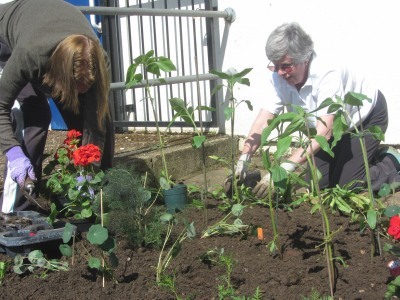 Children from Rush Common School visited to find out about the history of the old building and some of their pieces are included in the blog. 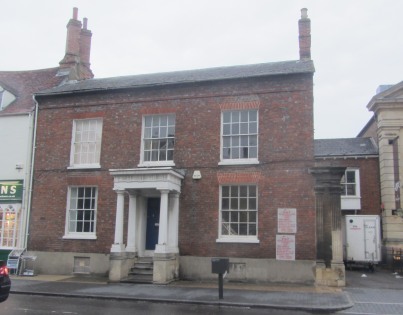 Visit 1-3 Ock Street Abingdon to find out more. 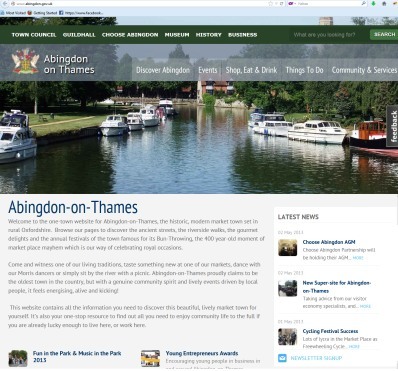 There was some criticism last year that there are far too many different websites trying to represent Abingdon and they are not joined up or giving the same picture of the town. 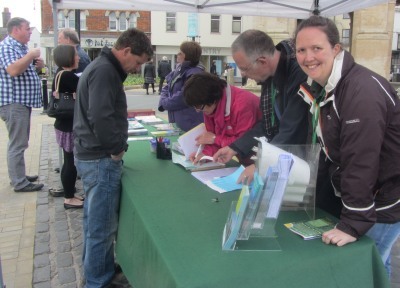 Today the Abingdon-on-Thames portal was launched. 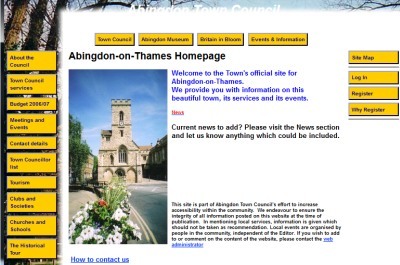 For the first time Abingdon-on-Thames Town Council, Guildhall and Museum, and Choose Abingdon are brought together in one website. There are also additional pages for history – with a section on people and places created by Abingdon Archaelogical and Historical Society. Then there are also sections for businesses, events, places to visit, and clubs and societies. 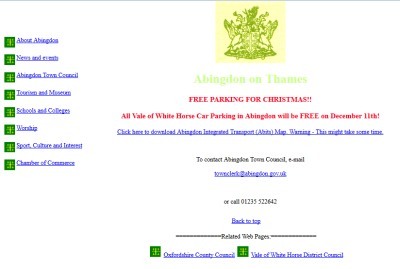 The first town council web site, that I remember, ran from 2000-2001. It looked good but, as I understand it, turned out to be a problem to maintain. For a while a temporary web site was used which could at least be maintained. That was replaced by a web site that ran from about 2005-2008. 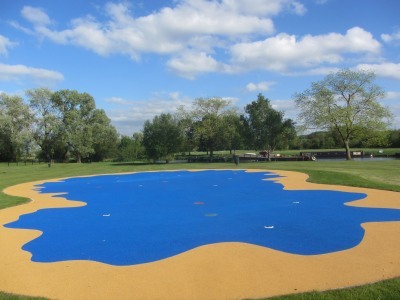 It was built on a standard package used by lots of local councils and similar bodies. A redesign from the same company was used until yesterday. The new portal looks the best yet. It just needs people to make sure all the content is there and updated when it changes. 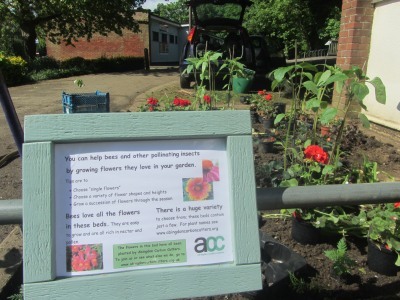 Next to the public toilets in the Abbey Meadows, the Abingdon Carbon Cutters have planted bee friendly flowers. Tomorrow is bank holiday and the sun does feel like it is having some impact on the prevailing cool air. On Bank Holiday Monday there are 4 guided walks to choose from – or leaflets available to follow at your own pace. All Free. Thanks to Marilyn for holding up the advert for me. 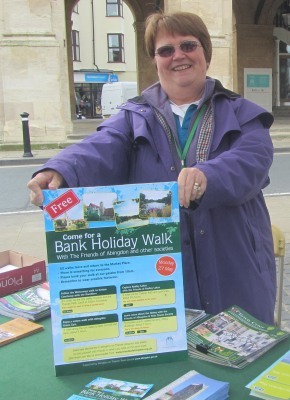 Walks are organised by Pat Bryden of the Friends of Abingdon, and her helpers. Marilyn, Alice and Mike Badcock were all on the Market Place, with other councillors (like the new Deputy Mayor Angela Lawrence and Hermann Matheson and Pat Longergan) advertising Fun in The Parks and Music in the Parks. Both events are on June 1st. The first is free. The second is by entry with a wrist band. Over 60% are sold. 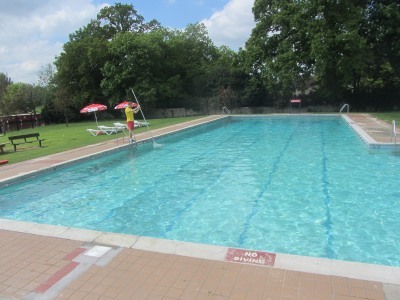 The Heated Open Air Pool opened for the summer season yesterday at 10am. Warmer weather is needed to cut down the heating bill, and to stop the trees dropping leaves. It was fine for 60 lengths by which times I got out to warm my feet a little. Not quite open yet is the recently refurbished water feature. But it looks amazing. Please leave a comment if there anything else on during the Bank Holiday (or half term) people might like.